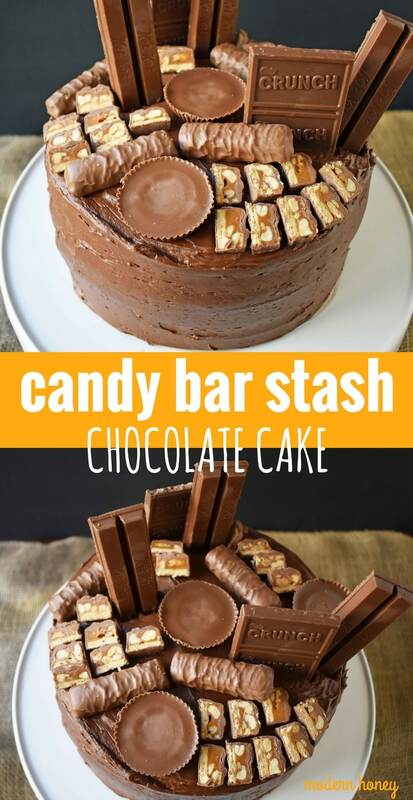 The Candy Bar Stash Chocolate Cake is the ultimate cake for all of the chocolate lovers out there. 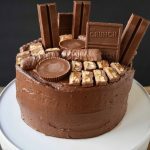 A 5-Star Rated Chocolate Cake Recipe with Perfect Chocolate Buttercream Frosting, topped with chocolate candy bars. This is such a fun and festive birthday cake! 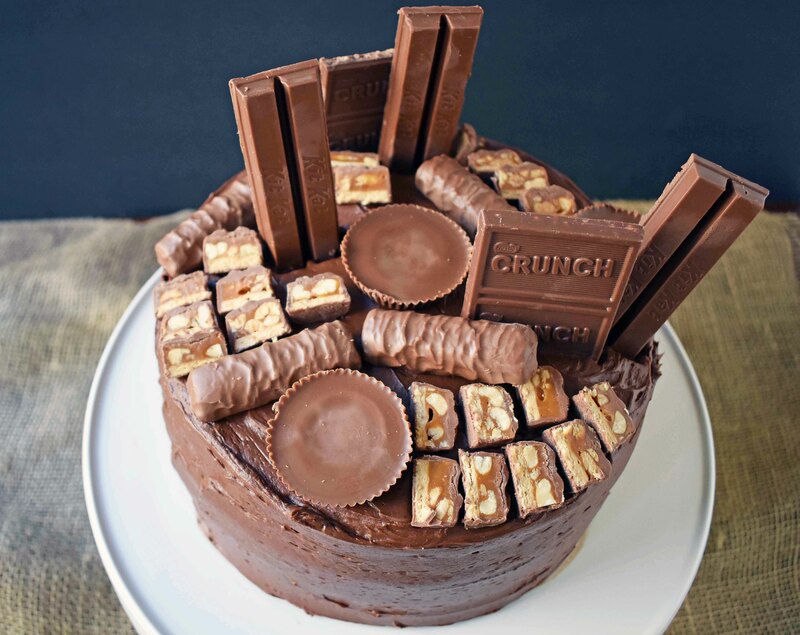 It’s National Chocolate Day! 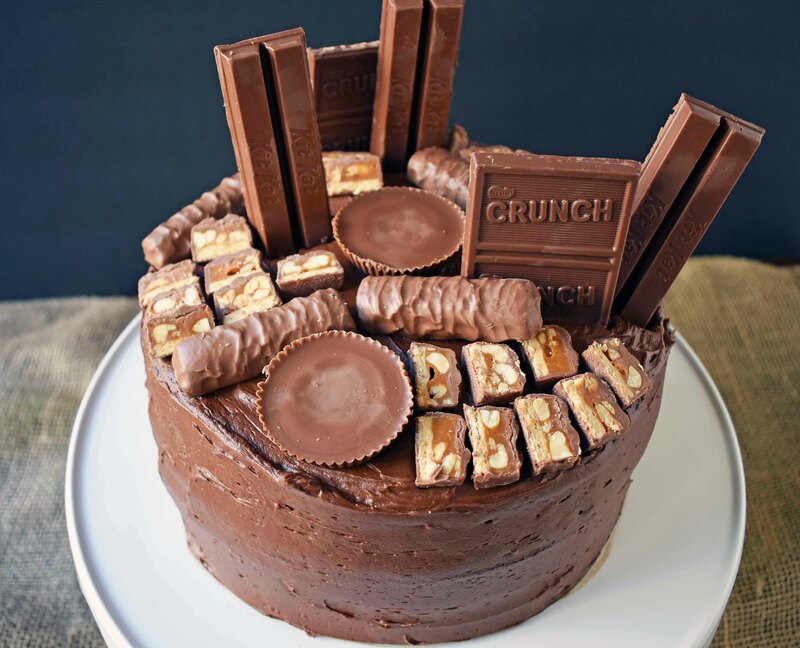 However, I don’t need a holiday to remind me to celebrate the greatest FOOD on the planet Earth, so let’s make a birthday cake to celebrate anyway. Because a party without a cake is just a meeting, right? Oh, and meetings are usually boring, right? So, let’s eat more cake! 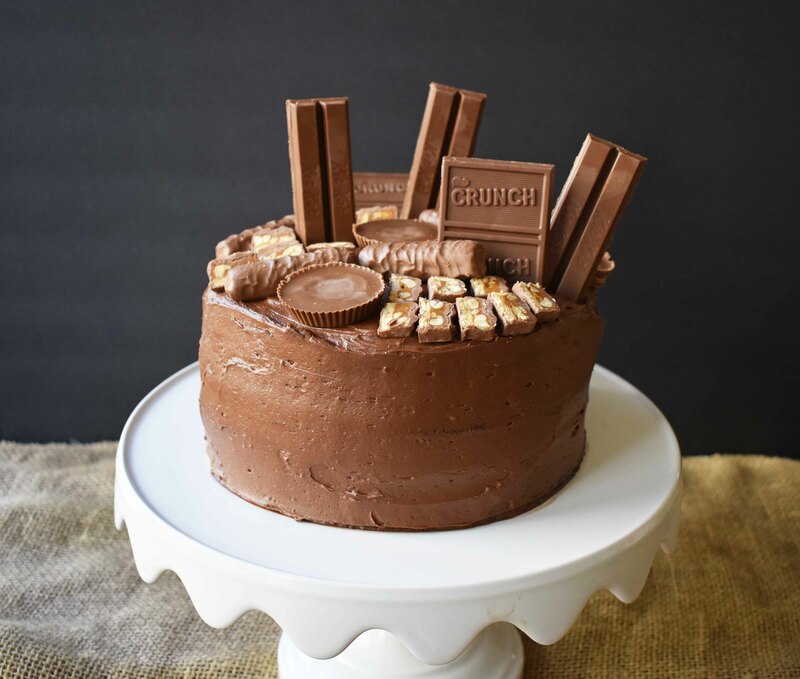 Since Halloween is just days away and you may end up with a candy bar stash that you have no idea what to do with…I would like to introduce a solution to your excessive candy bar dilemma — the Candy Bar Stash Chocolate Cake. This is basically a kid’s dream. 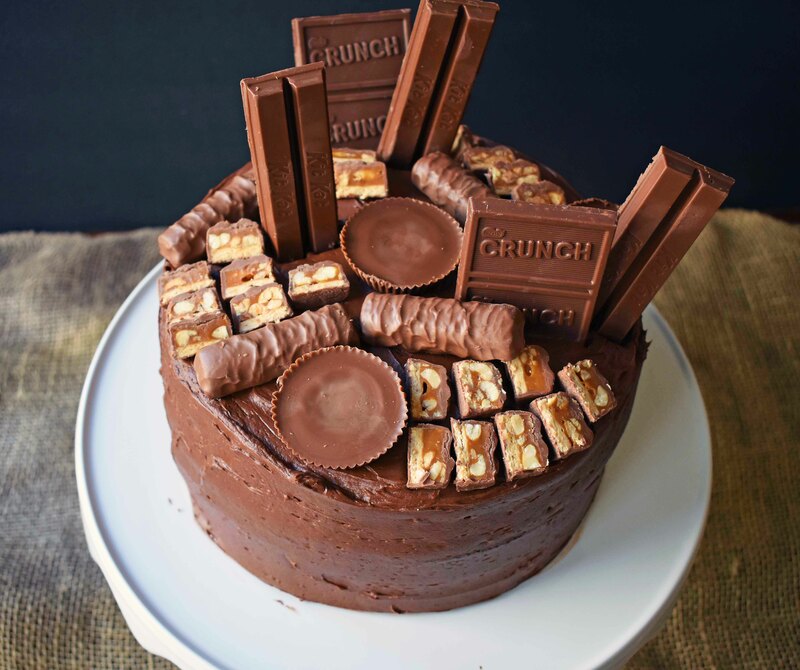 Let’s be honest…it’s MY dream cake. One of the top 5 recipes on Modern Honey every single day is my Love at First Sight Chocolate Cake (recipe HERE as well as down below). My amazing sister-in-law makes the most incredible cakes and is in high demand for weddings. Years ago, she did some serious research to come up with the ultimate chocolate cake. Every single Sunday she would try another recipe, tweaking the recipes over and over until she finally settled on the winner. This is it! If that isn’t enough, we decided to take it up a notch and add our favorite chocolate candy bars. 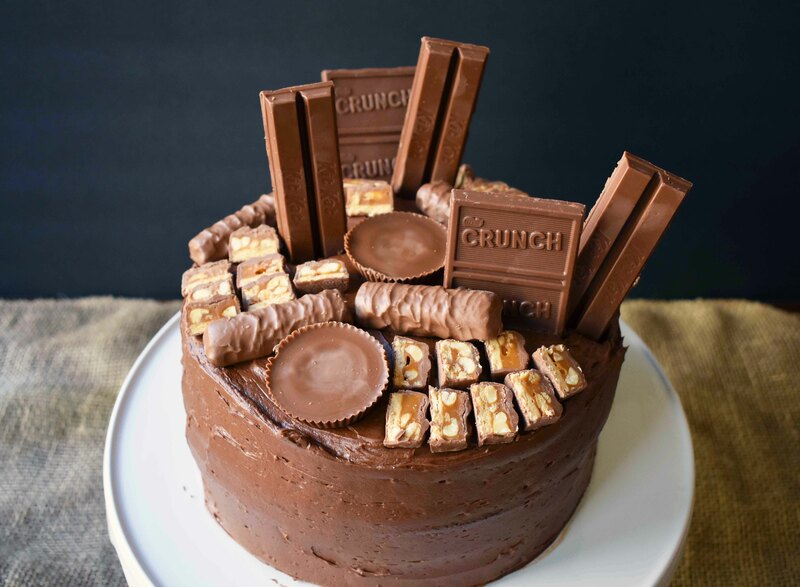 Once the cake is frosted, top it with a variety of candy bars making sure to do it right away as the frosting acts like a glue once it sits. 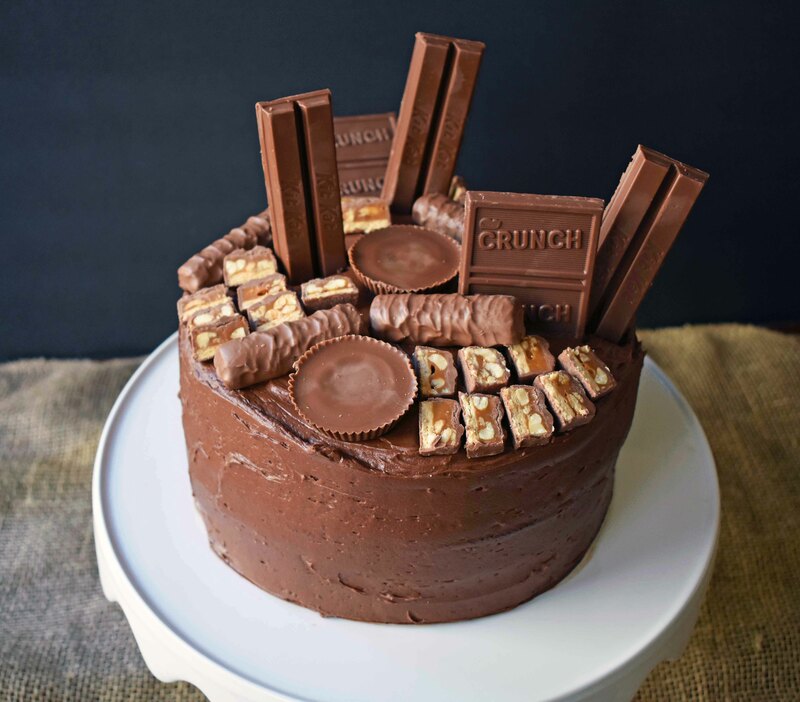 It’s fun to give dimension to the cake by using Kit Kat, Crunch Bars, or even full-size candy bars that stand up on the cake. Buttermilk is a must because it gives the cake melt-in-your-mouth texture. A high-quality cocoa powder can change the depth of chocolate flavor. I am the biggest butter fan in the world, but oil just works best in chocolate cakes (in my humble opinion). I have used both canola and coconut oils and both turn out beautifully. When I use melted coconut oil, there is surprisingly no coconut taste in the cake. Freezing the cake layers for even 30 minutes makes it easier to frost. This recipe can make two 9 inch layers, three 8 inch layers, or three 9 inch layers. I usually use three 8 inch pans in order to have slightly thinner layers so I can put more frosting in between! Once you taste this frosting, you will want more frosting on this cake too. It is absolutely heavenly! This chocolate buttercream is silky smooth and literally melts in your mouth. This is what I swear by to frost my cakes — click HERE for Icing Spatula. In mixing bowl, beat oil, eggs, buttermilk, and vanilla for 1 minute. Add dry ingredients to wet ingredients and stir until combined. Pour in hot water and mix together. Spray two 8 or 9-inch cake pans with non-stick cooking spray. You can also use three 8 inch cake pans for this recipe. Pour batter evenly into each pan. Bake at 22-27 minutes. Place toothpick or cake tester in the center of the cake to check if it comes out clean. Top with your favorite chocolate candy bars -- Kit Kat, Crunch Bar, Snickers, Reeses Peanut Butter Cups, Twix, Milky Way, Butterfinger, and M & M's. This is one baked good that gets even better the next day if covered. *If you would like to make a triple layer cake, 1 1/2 times the recipe and use three 8 or 9-inch cake pans. 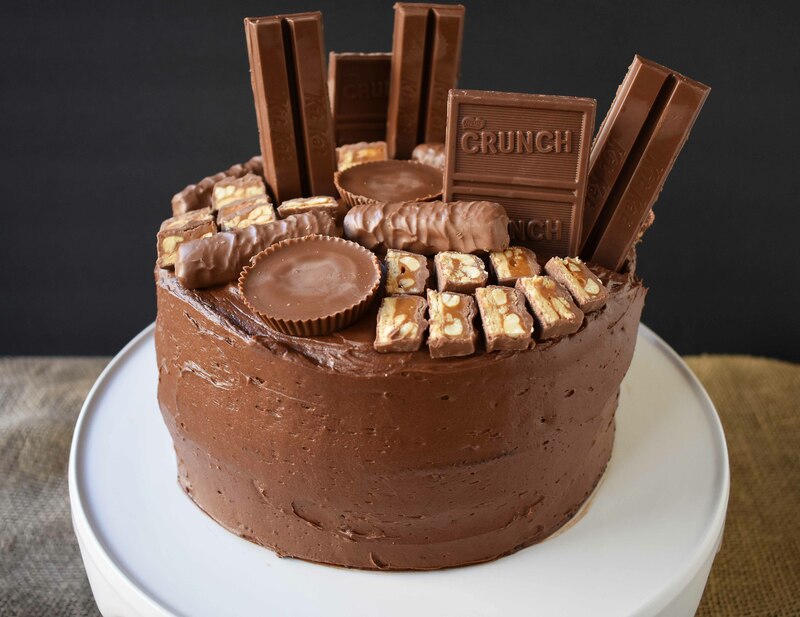 This Candy Bar Stash Chocolate Cake is my son’s birthday cake and I can’t wait to see the look on his face when I bring this baby out! Get a fork and dig in to the best chocolate cake on the planet! I love this recipe my kids loved it thank you!! Do you think this recipe would make good cupcakes? This is the best chocolate cake recipe! Tender, moist and perfectly chocolate goodness! I do a lot of baking and I made this for my son’s 10th birthday and everyone raved about the cake. This is my go to chocolate cake recipe from now on! Thank you for the recipe! Can you tell me what the 1 cup of hot water is for? I don’t see it listed in the directions. Hi Denise! I just checked and it is listed in the directions. You add it to the cake batter at the end. It helps to dissolve the cocoa and baking powders. The cake batter will be runny but it turns out perfectly moist.